A new "propulsion" concept has been developed based on a proposed resonance between coherent, pulsed electromagnetic wave forms and gravitational wave forms (or space-time metrics). Using this concept a spacecraft "propulsion" system potentially capable of galactic and inter-galactic travel without prohibitive "travel times" has been designed. The "propulsion" system utilizes recent research associated with magnetic field line merging, hydromagnetic wave effects, free-electron lasers, laser generation of megagauss fields, and special structural and containment metals. Research required to determine potential, field resonance characteristics and to evaluate various aspects of the spacecraft "propulsion" design is described. The field resonance "propulsion" concept has been developed utilizing recent research into the causes of solar flares, magnetic substorms, black holes, quasars, and UFOs. The concept is based on two assumptions: (1) Space-time is a "projection" of a higher dimensional space in much the same way that a hologram is a projection or a subset of our space-time reality, (2) A relationship exists between electromagnetic/hydromagnetic fields and gravitational fields - that is, Einstein's long sought for unified field theory can be developed. Mathematical relationships have been developed and theoretical concepts have been proposed to describe the causes and effects associated with the above assumptions, but experimental data is required to develop the correct theoretical basis for the assumptions (Rachman and Dutheil, 1979). Specific research in a number of areas is needed and will be described later. There does exist, however, some astrophysical data which tends to support these assumptions. For example, astronomers have speculated that a relationship may exist between black holes and quasars (white holes). The energy and matter which leaves space-time in a black hole may reappear at a white hole at some distant space-time point. For this transfer of energy from one space-time point to another to occur, some type of hyperspace or higher dimensional space (4th & 5th) is required. Assumption 2 may be the cause of the large amount of energy release in solar flares. In sunspot regions where solar flares occur, the 2-3 thousand gauss magnetic fields are configured such that the positive and negative polarities are in close proximity with each other. As a result magnetic energy is converted into kinetic energy. The magnetic field line merging process has been proposed as the most likely explanation for solar flare eruptions. 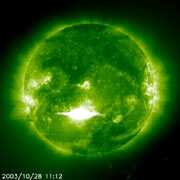 However, some flares can release energy which equals 10% of the sun's total output in a second. This large amount of energy is difficult to achieve with the magnetic field line merging concept. Thus it may be that the configuration of the magnetic fields and associated hydromagnetic waves (oscillation of field lines) may induce a "resonance" with gravitational fields resulting in a release of gravitational as well as magnetic energy. It is well known that the geometrical relationships of the magnetic fields (and thus the field gradients) are more important to the production of solar flares that the magnitude of the field strength. A strongly convoluted boundary between magnetic polarities results in a high probability for large and frequent flares. Another fact of interest is that hydromagnetic waves generated by solar flares have been observed to propagate across the chromospheric surface and trigger flares in other sunspot regions. Alfven waves, which appear to be the dominate wave form involved, change only the geometry of the field lines. This effect also indicates that the initiation of solar flares definitely depends on geometrical relationships as do the properties of space-time and gravitational fields. Magnetic field line merging has also been used to explain the interaction of the solar wind (and associated fields) with the Earth's magnetic fields at the magnetopause and the generation of magnetic substorms which often are triggered by solar flares. The magnetic field line merging process is also an essential part of the field resonance "propulsion"concept. UFO studies indicate that the unexplained (residual) UFO phenomena may be due to extraterrestrial visitors, parapsychological experiences, or a combination of the two. If some UFO phenomena are caused by extraterrestrial visitors in very advanced spacecraft, then the frequency of visits and the large number of different types of visitors (many different humanoids have been described) imply an ability to cross large stretches of galactic and inter-galactic space in relatively short time frames. If the speed of light is a true limit of velocity in space-time, then the potential extraterrestrial visitors must utilize a form of transportation which transcends space and time to keep the trip times short. UFOs are often observed to disappear instantaneously. In a subset of these cases, the UFO later reappears at a nearby location implying a disappearance from and a reappearance into space-time. The high speed, right angle turns, abrupt stops or accelerations of UFOs, and the absence of sonic booms despite calculated speeds of 22,000 mph or more suggest that UFOs may generate an artificial gravitational field or otherwise use properties of space-time which we are not familiar with. UFO propulsion systems appear to involve electromagnetic or hydromagnetic processes as evidenced by radiative effects on the environment such as burns, dehydration, stopping of automobile engines, TV and radio disruption, melting or alteration of ground and road surfaces, power disruptions, and static electricity effects. This data suggests that the unknown relationship between electromagnetic and gravitational fields may be used in UFO propulsion systems. The concept of transcending space-time for interstellar and intergalactic travel was felt to be a viable possibility based solely on theoretical studies in physics and astrophysics and UFO studies. But with the postulation and potential discovery of black holes, the potential for experimental support for this concept in the near future has been established. Astronomers have already speculated on the possibility that the mass and energy absorbed by a black hole may reappear in white holes or quasars. For mass and energy to be transported from one space-time point to another without an observable connection implies some form of higher dimensional space transcending space-time as we know it. The existence of a higher dimensional space would open up new space travel possibilities since the connections between space-time points through this hyperspace could involve laws much different than those which are so constraining in space-time. For example, if each space-time point can be assumed to be unique and if a relationship does exist between gravitational and electromagnetic fields, then each space-time point defined by a geometric form(Einstein's tensor metric) would be expected to have natural resonances with certain electro/hydro magnetic wave forms(geometric forms) which are(effectively) higher or lower harmonics of that space-time point(which is a"projection"of the higher dimensional space). The potential existence of the space-time harmonics mean that if a craft at a specified space-time point could artificially generate a configuration of electro-/hydramagnetic fields which has a resonance with a distant space-time point, a basic imbalance would be created. This imbalance would be out of harmony with the "projection laws" which create the space-time properties from higher dimensional properties. Forces would be set in motion to re-establish a balance which in this case require that the craft and its fields to be located at the space-time point where such field configurations are a natural harmonic of that space-time metric. The best analogy in every day life is that of tuning a radio. The tuning knob in this case is the spacecraft's mechanism for changing the configuration of the magnetic wave form. The radio stations are the various space-time points. For a radio, the signal (which is always there)is manifested through the speakers associated with the radio, for the field resonance system the speakers exist only at the radio station. Once the spacecraft's magnetic wave form is tuned into a distant space-time point, that wave form is forced to manifest only at that space-time point according to the "projection laws". A means of generating the electro-/hydromagnetic configurations which would be required remained a problem until the study of magnetic field line merging and hydramagnetic wave effects was undertaken. With the completion of recent thesis research, a possible means for generating the magnetic wave form was determined (Holt, 1979). This research along with the results of fusion research resulted in the proposed implementation of a spacecraft which generates megagauss magnetic fields which are oppositely directed (See Figure 3). These oppositely directed field lines will merge and re-connect expelling magnetic fields and plasma out to the sides. In this initial concept, expelled field lines again meet oppositely directed field lines and merge again, possibly forcing large amounts of electromagnetic and hydramagnetic radiation outside the craft. This concept is currently undergoing revision. In the proposed implementation (See Figure 3) high powered lasers are used to generate the megagauss fields by the effects of non-colinear temperature and density gradients (Kruer and Estabrook, 1977; Max et al., 1978; Nishihara and Ohsawa, 1976). By alternately pulsing adjacent laser sets, the location of the merging processes can be made to oscillate back and forth at a desired rate, The amount of laser energy can be varied to alter the strength of the magnetic fields. Thus by changing the laser's power and/or wavelength, and the pulse frequency, the resultant magnetic wave form can be changed or tuned to the desired harmonic of a distant space-time point. If flight to a nearby location is desired, the magnetic wave form can be continuously re-tuned allowing very quick and short space-time transformations. For an observer it would appear to be a smooth flight in much the same way that we do not see the individual frames of a film. For large jumps or travel to very distant space-time points, some means of preventing the tuning to intermediate space-time points is required. In the recent thesis work it was shown that hydramagnetic waves can inhibit or enhance magnetic field line merging depending on a number of factors including the magnitude and frequency of the hydramagnetic waves (Holt, 1979). Thus by generating the appropriate hydromagnetic waves, the generation of a coherent magnetic wave form can be prevented until the laser characteristics have been adjusted so as to generate the magnetic wave form which is a harmonic of the distant space-time point. Then the hydromagnetic waves can be stopped and the magnetic wave form can develop. The medium in which the magnetic field line merging occurs (vacuum, ionized gas, etc), energy storage requirements, the pumping mechanism for the lasers, and crew control interfaces are currently being studied. To avoid large energy storage requirements, magnetic pumping of the lasers may be utilized to allow a reuse of a portion of the laser energy which is otherwise radiated. It may also be possible to obtain substantial energy during the initial part of the process of tuning to a new space-time point through the resonance with gravitational fields. By allowing the craft to continuously shift or oscillate to new, nearby space-time points, a continual supply or energy could be obtained while in a hovering mode. The oscillation could be accomplished by the modulation of magnetic field line merging by adjusting hydromagnetic wave parameters. This technique would provide energy for the lasers without disrupting major laser re-tuning processes. The outer shape of the proposed spacecraft is a "winged disc" (See Figure 4 ). The wings would be used for testing purposes only and could later be eliminated following sufficient testing (Grief and Tolhurst, 1963). The magnetic field line merging process and the effects of varying associated parameters requires extensive study. Specific laboratory tests should be conducted, some of which could be conducted in association with fusion research. These tests should be supplemented by computer modeling studies and the collection of experimental data on magnetic field configurations and hydromagnetic wave fluctuations before and after solar flares and geomagnetic substorms. The generation of megagauss magnetic fields by high powered lasers and the effects of varying laser parameters should be studied in laboratory experiments. Much of this research could be accomplished in association with fusion research. Containment and protective materials and structures for the spacecraft could also be a by-product of fusion research. The pumping of lasers by the use of magnetic fields should also be studied in laboratory experiments. Extensive measurmenets of the radiation emitted by UFOs would be extremely useful in gaining insight into the physics and technology UFOs may represent. These measurements should include photographic spectra (using special filters for cameras), magnetic measurements (using high sensitivity detectors), recording of radio and sound frequencies, and the use of geiger counters to detect high energy particles. A large distribution of special detectors, as described above, should be made to UFO investigators, police departments, and other interested individuals. In addition, portable modules containing sophisticated detectors should be located at strategic positions in various countries to allow rapid transport to high activity areas. Effects on minerals, plants, animals, and humans should be studied to gain insight into the radiation emitted by UFOs. Effects on humans such as burns, symptoms of radiation sickness, and other body changes should be thoroughly investigated by physicians. Regressive hypnosis should be used extensively to obtain technologically valuable information from UFO close encounter participants. Three dimensional models of the exterior and interior of UFOs should be made for cases which are significant from a technological point of view. As soon as some of the basic interactions are better understood or after a thorough review of the state of the art of hydromagnetic interactions is completed, small scale test models of the propulsion system and spacecraft should be constructed and extensive testing performed, The testing should proceed hand-in-hand with the results of other research. Several test models may be needed in case one or two are "lost". Since the field resonance concept utilizes two unproven assumptions and currently unverified magnetohydrodynamic processes, the concept is likely to require extensive modification and perhaps a complete revamping following initial research activity and subsequent feasibility studies. I am confident, however, that the research accomplished under the motivation of this or a similar propulsion concept will result in theoretical and technological advances and ultimate break throughs in propulsion and energy systems. Grief, R. K. and W. H. Tolhurst, Jr., Large-scale wind-tunnel tests of a circular plan-form aircraft with a peripheral jet for lift, thrust,and control, NASA Technical Note D-1432, Ames Research Center, 1963. Holt, A. C., Effects of hydromagnctic waves on magnetic field line merging. Master's Thesis, University of Houston, Clear Lake City, May 1979. Kruer, W. L. and K. Estabrook, Laser light due to self-generated magnetic fields, Physics of Fluids, 20, 10, p. 1688, October 1977. Mishihara, K. and Y. Ohsawa, Magnetic field generation due to resonance absorption, Physics of Fluids, 19, 11, p. 1833, November 1976. Max, C. E., W. M. Manheimer, and J. J. Thompson, Enhanced transport across laser generated magnetic fields, Physics of Fluids, 21, 1, p. 128, January 1978. Rachman, A. and R. Dutheil, On the special relativity theory in a superliminal world variety, Laboratoire de Physique, Faculte' des Sciences, Poitiers and Laboratoire de Physique Theorique, Institut Henri Poincare, Paris, 1979. Humankind's most valuable possessions are privacy, solitude, and anonymity.